Home » Stop Smoking » Improve your employment chances by quitting #smoking? Improve your employment chances by quitting #smoking? According to new research smokers struggle to gain employment compared to non-smokers and those who were employed were paid less than non-smokers. Researchers surveyed 131 unemployed smokers and 120 unemployed non-smokers in California. Even when factors such as duration of unemployment, race and criminal record were controlled for smokers were still at a disadvantage: after 12 months the re-employment rate of smokers was 24% lower than among the non-smoking group. If you are a smoker and would like to increase your employment prospects you can get help form the local stop smoking service. 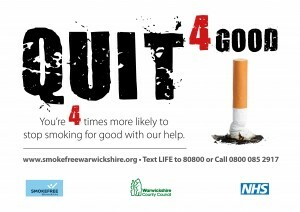 For more details on NHS Stop Smoking Services (including the new online help) in Warwickshire go to www.quit4good.co.uk or phone 0800 085 2917.